Memorial stone in Cabrach churchyard, taken 16/07/11. Records death of Annie, age 11 years, at Dulix (now Dulax). She is mentioned on this site as dying from osteomyelitis and pericarditis. cause: Osteo Myelitis 10 days, Pericarditis 1 day. The following are the family origins of the Kellas Family originally from the Cabrach and ancestors of who Ann who died at Dulax. Baptismal Entry from Cabrach OPRs: 1727 February 19: Alexander Calles/Kellas had a natural son baptised, John Calles/Kellas his brother being sponsor and taking on of vows, called John. (Based on interpretation from written entry). There being a flagrant request of Janet [Fettas] [for ... ting (fornicating?)] to Alexander CALLES in Tornichelt [is with] child and being [cited] to this [district] being called did com[pear] and being interrogated [ ]anent and acknowledge of same of [great/gabe] [...ys] Alexander Callas Younger [in....] Tornichelt, an unmarried man as if [payment (Payt)] [?? of ??] after grate (cf gabe above) exhortation she was cited; agreed [ ] to of next meeting and of [ ] Alexander Calles was appointed to be cited [to] [is ...] district. Closed with prayer. 1726 December 18: Alexander Calles being cited and called did [compear] and acknowledged his guilt [out of a ...] Janet Fettas and being suitably [on betted] did engage to make his publick appearances when required, and to pay his own and [the] womans penalties. The [wife] Janet Fettas is appointed to begin his publick appearances [at] next Lords day. Closed with prayer. John's parents are listed as Alexander Kellas and Janet Fettes?. 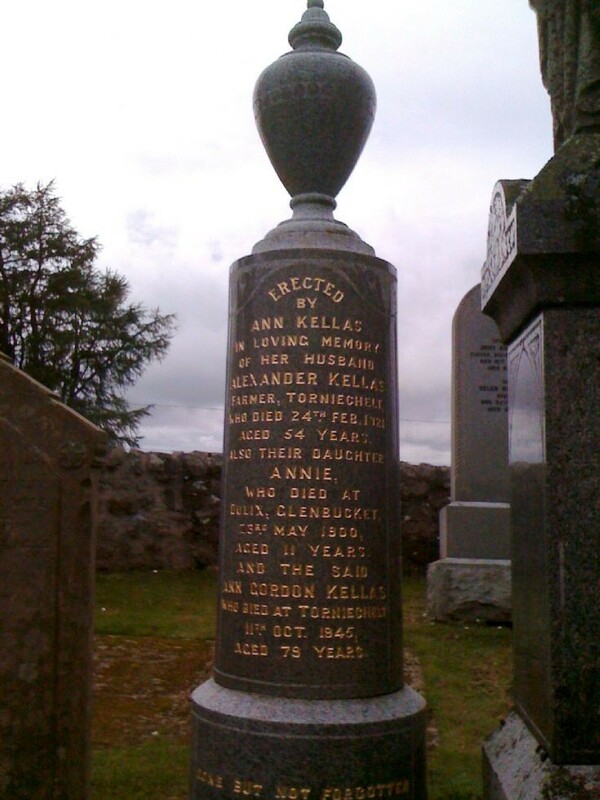 Additional notes : this appears to be the first kellas in the Cabrach (John's father Alex). There are Kellas' in Strathdon at least 50 years earlier. Graham has not given references for these assumptions. John was possibly adopted (sponsored) by his father's brother John. (REF:Kellas Familes in Cabrach Parish and Strathdon Parish, Carol Fordyce) = possibly Graham Kellas has seen these records and made above assumptions. John Kellas in Torniechelt had a son by his wife Margaret Stewart baptised and named Alexander, witnesses Alexander Strachan in Peathaugh and James Milne in Torniechelt. In the rent roll for Torniechelt (1784-1803), Hugh and brother Alexander paid 7pa for a half-share; the other half was rented by Alexr. Robertson. In 1804 they have all of the farm, for 20pa. Evidence for marriage to Margaret Souter from James Kellas death cert, which names Alexander Kellas, farmer at Torniechelt and Margaret Souter as parents. Erected in memory of Hugh Kellas farmer died Torniechelt 25 Apr.1875, aged 73, his wife Isabella Grant died 25 Jan.1877, aged 72. In Torniechelt, in one (1) inhabited building were Hugh Kellas Farmer 35, Isobel Kellas 30, Ann Kellas 11, Janet Kellas 8, Isobel Kellas 6, Hugh Kellas 4, John Kellas 2, Robert Kellas 1. Erected in memory of HUGH KELLAS farmer d. Torniechelt 25 Apr. 1875 aged 73 ? ?, his wife ISABELLA GRANT d. 25 Jan. 1877 aged 72. 1877 16 Feb Age: 42 Marriage to Margaret Johnston Draper Dunedin, New Zealand Marriage Reg #765/1877 - Found under surname of Kellens. 1893 Age: 19 Arrived in Maffra Maffra, Gippsland, Victoria, Australia John was not able to work on his family's farm in New Zealand possibly due to having a club type foot so he moved to Maffra where he taught violin and had a stationary & fancy goods store. 1943Age: 57 Residence Maffra, Gippsland, Victoria, Australia Maffra - music teacher (violin) & home duties - son Gordon (shop assistant) listed in 1931. 1990 Inclusion in "Gippsland in Focus" book Bairnsdale, Victoria, Australia Gippsland in focus : a directory of photographers to 1950 / compiled by Debra Squires, Linda Barraclough, Helen Clothier. 1863 26 Feb Age: 23 Departure Melbourne, Victoria, Australia On board MSS Gothenburg with brother Hugh. 1887 4 Nov Age: 48 Departure Dunedin On board Union Co's Te Anua with family. Via Hobart 8th November. Illegitimate son of James Kellas (I have birth cert). His mother later married John Kellas (surely James brother). Gravestone of an Alexander Kellas married to Ann Gordon at Cabrach has birth ca 1866. Gravestone has him as a farmer at Torniechelt. NOT 100% sure Alexander son of James & Alexander wife of Anna are the same person - need to find wedding cert. If correct, Alex and Anna were 3rd cousins. In 1871, Alexander is with his Kellas grandparents at Tornichelt, then in 1881 with uncle John Kellas also att Tornichelt. Obituary in Dufftown News 20th Oct 1945.